This little clownfish is one of the cute marine creatures which are exhibited in Seoul Coex Aquarium. It swims freely in the display tank with many other marine fishes. The head of the clownfish with white stripe looks like the face of a clown. 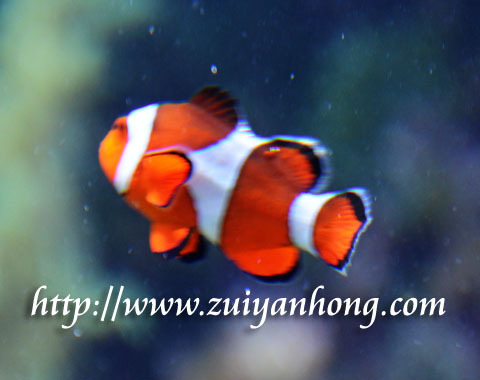 That is the reason the colorful clownfish got its name. Commonly found in warm water ocean, the clownfish is also named as anemone fish because it is closely related with the anemone. The body secretion of the clownfish prevents it from becoming food of the anemone. Moving around the anemone, the clownfish is safe from being attack by its predators. In return, the clownfish helps the anemone to obtain food by attracting fish to get near the anemone. The relationship between the clownfish and anemone is just like people and government. The government should keep their promises otherwise it sure would be rejected people in the general election.